Read below for a great reason to greet this fall with a new Caldera Spa from North Shore Pool & Spa! 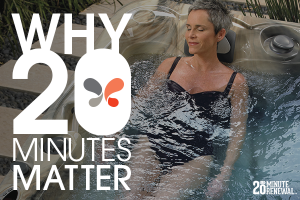 According to Dr. Becker’s research, the advantages of warm water immersion develop and reach their maximum benefit after about 20 minutes. Research such as Dr. Becker’s is one of the foundation blocks of personal wellness benefits associated with daily hot tub use.